I realize that both of these issues have been reported to the Cocoatech developers, but I wanted to reiterate the post made by Ingo on August 12th as I observe the same issues. Actually, I have has the nmblookup issue with certificate used for all of the v8 versions. Hopefully in letting you know that more people have these issues, will escalate the priority of publishing a fix......and (IMHO) the website cert should be fixed TODAY !! Going to the support site and being presented with a "this site may not be secure and somebody may be impersonating support.cocoatech.com", does not make Cocoatech look very good (or competent). Since there is no need to re-invent the wheel here. Ingo did a great job of that, I am simply gong to repost (and add an attachment showing the error). Then, when I tried to open https://support.cocoatech.com I run into a certificate error, since your certificate shows the wrong Domain Name. Please explain what is going on there. I am in general a happy and more than once paying customer, but fishy TLS certificates and code signatures are not acceptable in 2018 anymore. Path Finder Support Team closed this discussion on 17 Aug, 2018 02:08 PM. I'm seeing this on https://support.cocaotech.com/ in Chrome. Agree with the points above. We're using PF to handle all kinds of local and remote server traffic, running terminal from it, etc etc. If the File Manager and its Developers' support site have invalid certificates this doesn't fill me with confidence in the rigour of the dev/commit methodology behind the current incarnation of the product. Path Finder Support Team closed this discussion on 18 Aug, 2018 03:40 PM. BTW, on a Mac using Safari, the site cannot be reached. After clicking "Visit the site" it just re-prompts warning that "This connection is not private". 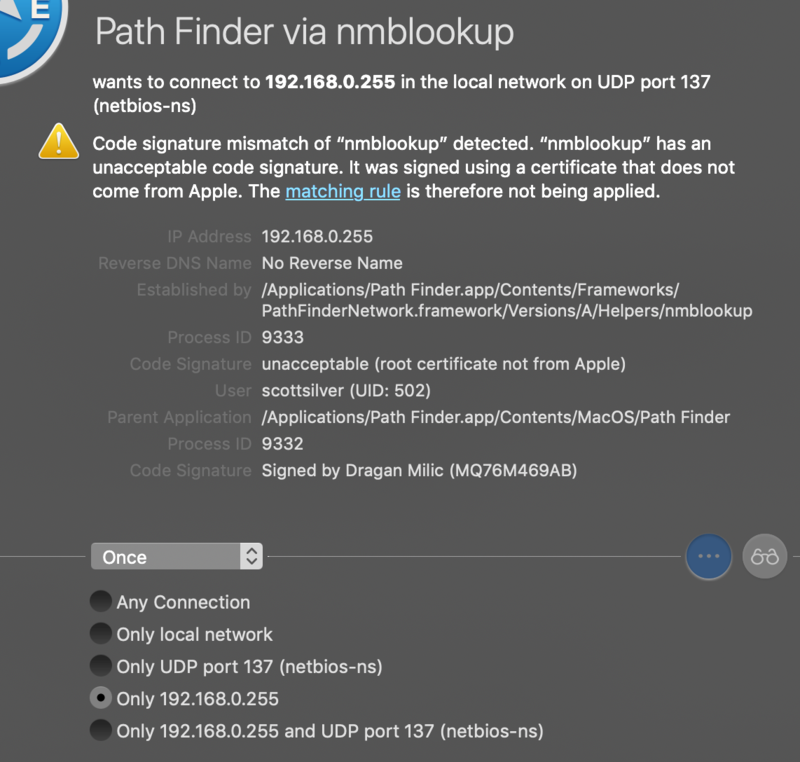 Same problem here: Little snitch blocking pathfinder: “nmblookup” has an unacceptable code signature. 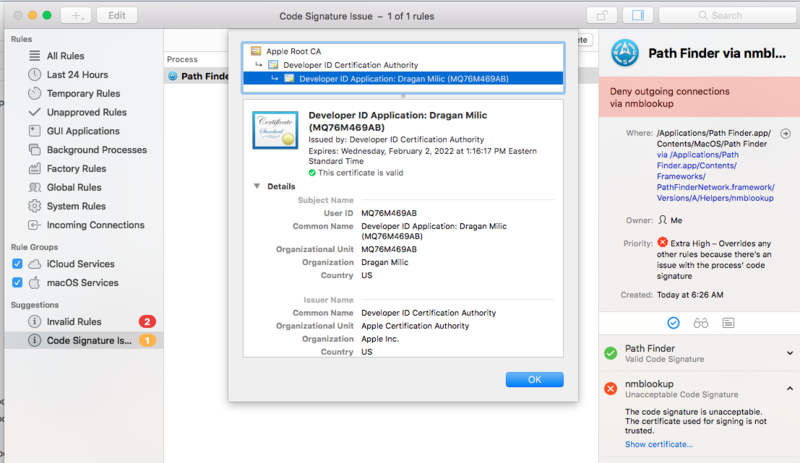 It was signed using a certificate that does not come from Apple. Any ETA when this will be fixed since the bug has already been reported in August? Path Finder Support Team closed this discussion on 22 Dec, 2018 11:53 AM. Same here, on 10.14.2. Pretty annoying. Path Finder Support Team closed this discussion on 29 Dec, 2018 07:39 AM. Persistent error over the last few days over the last few days with little snitch throwing this same error. If users do not have little snitch installed then they are completely unaware of the invalid signature. I'm not trying to connect to your website, only use the program (Which I love, but am concerned that this issue has been left unpatched for so long. Is there a reason the code is not signed correctly? How do I know I don't have an unauthorized version? It may take some time, unfortunately, to fix this issue, as there are many others. Path Finder Support Team closed this discussion on 31 Dec, 2018 10:28 AM.